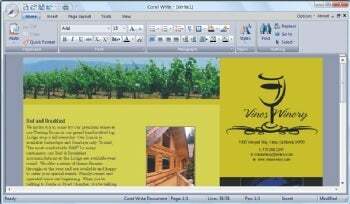 Corel's new lightweight Home Office Suite ($69, free trial) includes the Corel Write word processor, Corel Calculate spreadsheet, and Corel Show presentation creator. It's a definite improvement on the company's previous suites in terms of usability. The first thing that jumps out at you about Home Office Suite is how much it's borrowed from the design of Office 2007. Déjà vu features include the Office button (Quick Access button in Corel-speak) and the ribbon, which Corel calls the Tabbed Toolbar. It even improves on the ribbon concept with cascading sub-toolbars/ribbons. Copying Office 2007's look is a good thing in my book, though the real secret to Office 2007's success is its grouping of tools and options, which is far more logical than its predecessors and competition. Corel's suite doesn't manage quite as well in that regard--I especially missed Office 2007's floating formatting toolbar--but it's darn close and very easy to use. There's no way to discuss every feature in a suite. However, while Home Office isn't as feature-rich (or bloated, depending on your point of view and requirements) as Office 2007, it still offers enough features to create great-looking documents, spreadsheets, and presentations. I spent most of my time in Write; although as a writer who works with editors I missed revisions mode, I found the formatting and other features more than adequate. My time in Calculate and Show proved equally satisfying. Corel touts the suite's light footprint as rendering it particularly suitable for Netbooks, so I installed the suite the company provided on my Acer Aspire One to see just how much tailoring had occurred. I didn't notice a performance gain over Office 2007, and the boot time for Write was actually a tad slower that for Word 2007. As some netbooks ship with only 512MB of RAM, memory hungry apps can be a problem. Happily, memory usage for the three Corel apps was, on the whole quite light, and noticeably less than what I observed from their Office 2007 counterparts. Note: Memory usage can vary wildly from launch to closing. My reporting is based on what I observed after launch, then opening a small document, minimizing and restoring the program window. Another netbook performance issue is the breed's (especially early models) slower hard drives and SSDs. Fortunately, Home Office seemed to go easy on the disk access and I noticed no undue pauses or delays while code or data was read or written. I noticed only one minor bug in the Home Office suite: When maximized, all three apps prevent the mouse cursor from activating the Windows Start Menu/Taskbar when it is hidden using the 'Auto-hide the taskbar option'. You can still press Ctrl+Esc to access the Start Menu/Taskbar. Corel states 1024 by 768 pixels as the required resolution for the suite. That said, all three Home Office applications worked just fine within my Aspire One's 1024 by 600 resolution screen--especially after minimizing the Tabbed Toolbar. The suite also lived up to its claim of compatibility with Office 2007 and imported all the .docx, .xlsx, and .pptx files I threw at it, though it required downloading the Microsoft Office 2007 compatibility pack first. Despite not quite living up to the tailored-for-netbooks hype, Home Office is a worthy and more affordable alternative to Office 2007 for those who need only the basics.